NASA now gives anyone the opportunity to send their name to Mars. 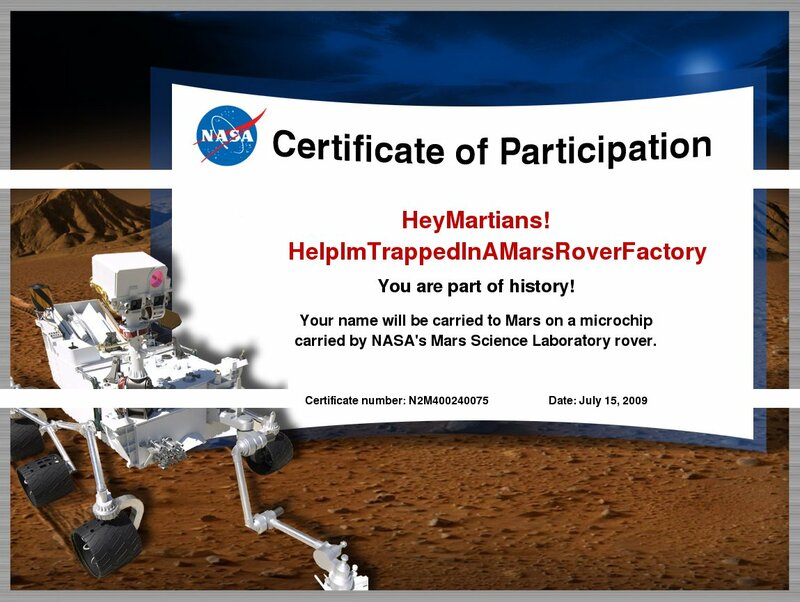 Just enter your name, country and zip code into the form, and your name – along with many others – will be included in a microchip on the Mars Science Laboratory rover which will be heading to Mars in 2011. NASA has actually done this before, for example, you could have sent your name to Mars with the Phoenix rover. However, now that this has been found by Reddit, I’m afraid that that list of names sent to Mars will be an odd one indeed. First of all, there’s no captcha, and the form accepts nearly anything, even very long entries. Check out some cool examples here and here, and hurry up if you really want your name to be on the Mars, because I suspect that the form might stop accepting new entries soon. So far only 146 people from Lebanon have entered there names, in contrast to 137864 names from the US. Visit the site and fill in the form.